I’ve been wanting to find a replacement for my Silk soy creamer, since I don’t feel like it’s the healthiest option in the morning. I’ve been excited to make this and made it for the first time this morning. Delicious! It has a creamy richness yet it’s totally guilt-free. Thank you- I’m telling all my health-conscious friends about this one. What type of coffee do you recommend? Which one is your favorite? Would love to know, thanks! Thanks for this!! I had tried store-bought almond milk previously and didn’t like it in coffee. This tastes great!! Thank you! Will this recipe work when using bought almond milk? Thank you. I have no idea! I’ve found that store bought almond milk usually separates in coffee, but maybe the coconut oil addition would help… you’ll have to let us know if you try it! Hey, Carol! Did you try this in store-bought almond milk? If so, did it work? Thanks! Finally a satisfactory vegan half and half substitute! The color in coffee is GREAT (one of my main objections to other substitutes) and the taste is very good — much better than plain almond milk (which we rejected long ago for coffee). Does anyone have any insight on how to turn this into french vanilla creamer? (How much vanilla and liquid sweetener) If I use maple syrup to sweeten, do I need to blend it together, or can I mix by hand? On Saturday I stared a “no dairy, no sugar” phase of life, since it has become clearer and clearer to me that dairy makes me feel ill, and I was concerned that if I avoided dairy, I might choose more sugary items as a substitute. The big dilemma I discovered right away was coffee creamer—if it doesn’t have dairy, it has sugar, or sugar solids. My search for something else, preferably something that would make almond milk less likely to curdle in coffee, led me to this recipe. You recommended to save the almond pulp for another recipe, what would you use it for? Always interested in using every last drop to make it stretch further 🙂 Got my almonds soaking now to try this recipe out. Cant wait I haven’t found a good replacement yet for creamer. What can we do with the almond pulp that remains? have you tried adding Vanilla or Vanilla Bean to this recipe? also, can the recipe be reduced in volume as I don’t think we would go through 4 cups of creamer in a week if just used for coffee. Suggestions? You’re welcome to reduce the ingredients proportionally to make a smaller amount! I’m sure vanilla would be delicious, too, if you like that flavor in your tea or coffee. I love this recipe, thank you for sharing! I was wondering… since 4 cups is a lot for a small household like mine, do you think the creamer would hold up well being frozen and thawed later? Just curious. Thanks! I’ve never tried freezing it, so I’m not sure on that one. You’d probably need to blend it again once it’s thawed, to incorporate the coconut oil again. The Vitamix is usually powerful enough to melt the coconut oil during the blending process, so I wouldn’t worry about melting it beforehand. I’m currently soaking almonds to make this! I haven’t made my own almond milk before (though I’ve made oat milk) because the price of almonds here makes it more expensive than buying it. However, I’m newly vegan and have heard so many good things about homemade almond milk in coffee that I just have to try it! I’m currently using the silk creamer and it’s okay, but I’m hoping this will be even better! I am one of those girls that simply can’t go without her daily cup of coffee (or three :)). Oh. My. Goodness. I am so happy right now! I recently changed to a vegan diet, and one of the things I’ve absolutely missed most has been creamer in my morning coffee. I already make my own almond milk, but never considered putting coconut oil in it to make it creamier. I just made a batch of this, and it is absolutely delicious! Thank you so much! I made this today with my new Vitamix and I finally found a natural creamer that didn’t have a strange test, nor any added sweeteners! Plus, it is so creamy! I cut the water by 1 cup, but it is heavenly. The added coconut oil really makes a difference. PS…the second cup is completely cream all the way through, no swirling!! I liked the swirling lol…but I like creamy better!! I just found your site a few days ago & just in time, cuz I was just about to sell my vitamix!! I KNOW!! I hated calling the lady who was going to buy it to tell her that I had changed my mind, poor thing, she was crushed but she understood. Anyway, I just tried the Almond Coffee Creamer & it was so good! I love a real creamy look to my coffee & the first cup provided that for me…I haven’t tried 2nd cup yet, but will after sending this. With each sip, I loved watching as it separated but then swirled right back into connective formation, looking just as perfect as the sip before. Underneath that creamy look, lurked a darker mix, that I only caught glimpses of after each sip. I hope each cup is like that & just not the first, due to being a freshly made batch. I used 3 cups of soaked almonds to make my creamer. I’ve tried using just homemade almond milk, but it just wasn’t the same, I couldn’t even finish 1/2 a cup & would dump it & make a fresh cup with half & half. 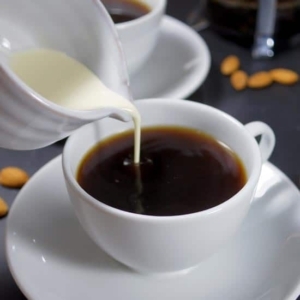 I just love this new creamer, thank you for posting all of your wonderful recipes. I’m new to food combining & raw, however your site & recipes are making it fun & easier to get started & keep going. I can’t wait to try the mint ice-cream! The pumpkin bars! muffins, etc!! Oh & the banana cookies…I could go on & on, they all look so good!! Also next on my list are your salad dressings, I’m sure I will fall in love with greens all over again with them. Sorry for the rave being so long!! It’s not as thick as traditional cream, but the added oil is what makes the difference in the creamer– it’s emulsified into the almond milk, making it thick with a creamy texture. You can try using only 3 cups of water for an even creamier texture! Thanks for this! Any suggestions for uses for the left over almond pulp? I think you can dry almond pulp in the oven and use it in recipes similarly to almond flour… however, I’ve never tried it myself! I haven’t had any luck using the wet almond pulp (the flavor and texture aren’t great) so you definitely need to dry it first. I’ll be sure to post a good recipe if I ever have some success! I like to add the leftover almond pulp to my homemade granola. I was wondering if the coconut oil has to be soft or hard from the fridge when added to the almonds? Soft coconut oil would probably emulsify faster in the blender, but it should warm up quickly, regardless, with the blending! I tried to make the cream not sure what i did wrong but it still seperated in my tea. Help! Maybe you need to blend it together longer? The coconut oil needs to emulsify into the almond milk, to avoid separation issues. A powerful blender, like the Vitamix, can achieve that in less than a minute, but a traditional blender might take longer. Hope it still tastes good, regardless! Thanks sooo much! The coconut creamer that I have been purchasing at the local health food store is very expensive!!! Thanks for the wonderful recipe. Since my husband and I became vegan about ten months ago we have been struggling to find a suitable replacement for milk in our morning coffee. I used a blender that has an attachment to make soy milk and it worked perfectly. Another recipe I can’t wait to try! I love the bottle you store your creamer in….so cute! of calcium for an expecting mom? Oh my God! It’s so mouth-watering! I can smell the aroma from here, haha! Well honestly, I am not drinking coffee due to palpitation but I can’t really wait to try this at home. I really love the coconut oil and almond combination. I think that it tastes so sweet, really delicious! I also love the fact that it’s healthy. Thanks for sharing this lovely recipe! Sounds absolutely delicious, will be trying this tomorrow with my black coffee!! Cannot wait to try this recipe! What if I made homemade almond milk before hand, can I just add the coconut oil and strain all together? Thanks! I have tried many times your almond milk creamer and it has always separate and curdle in coffee. Also coconut oil tends to separate in upper part of creamer. Please can you write me how and what to do with it. Hmm… it sounds like the coconut oil isn’t emulsifying with the almond milk in your blender. If you’re using a high-powered blender, like the Vitamix or BlendTec, it should take 30 seconds to a minute for the coconut oil and almond milk to emulsify. If you’re using a less powerful blender, it may take longer than that. 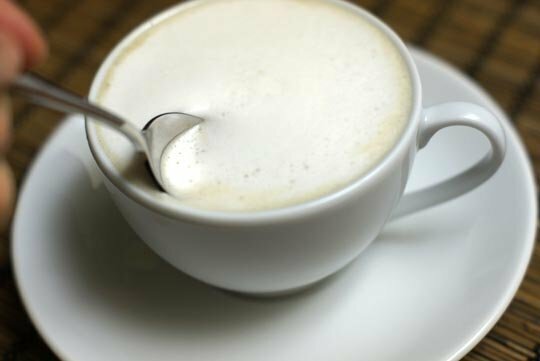 It’s normal for the almond milk to separate while stored in the fridge, but shaking it before adding it to your coffee should remedy that. And it definitely shouldn’t curdle in your coffee! I’ve never experienced that with homemade almond milk– just the store-bought variety– so hopefully blending it longer will do the trick. I would think any oil would probably work! Maybe almond or grapeseed oil would be worth a shot? I was wondering if I could use this as a creamer for almond milk ice cream?? This is absolutely brilliant. I use almond milk in my coffee quite often and I always wish it were a tad bit thicker. I love this! Thanks for sharing. This is awesome-I pinned it 🙂 I am making this creamer first thing tomorrow morning! Thanks for the reminder– I actually recommend discarding the soaking water for the almonds, because it should contain the enzyme inhibitors that are removed through the soaking process. I like to rinse the almonds after soaking, then use 4 cups of fresh filtered water for making the creamer. Do you include the soaking water with the almonds? I just tried making this but there was no liquid to squeeze out. Great idea to add the coconut oil to almond milk! Love it. I have an obsession with coffee, but actually prefer it black. In the afternoon, sometimes its nice to switch it up though! This looks so delicious and creamy, I’m going to make this afternoon, thank you!! I just tried another coconut creamer this week which was also good, using coconut milk from a can…I know, cans not always best but this was nice. Thank you for posting this. I will be making this as soon as I replenish my coconut oil. I love both but start the day with tea so I don’t jolt my system..I will have a few sips of my sweeties! : ) I love this idea…I use almond milk in my tea and coffee and have just adjusted but this sounds great. I was always under the idea that the almonds wouldn’t yield much milk but for 1 c almonds you get 4 c milk-I am in! I freakin’ love coconut oil…makes everything taste better..but that’s something I have got to watch too! 🙂 Have a great day! Can’t wait to try this one out! Yes, I know some recipes call for a 3:1 ratio of almonds to water, but I like getting more “bang for my buck” from those pricey almonds! It works great, especially with the coconut oil addition. Great idea! I’m not a coffee drinker but I do drink a lot of tea. I’m not really big on creamer but I’m thinking that this could be added to chai tea with a little stevia and it would probably make an amazing chai latte!